Dunbar and Boardman: How Does the Schmid Peoplemover Work? In 1999 Emil Schmid, the owner of Schmid Maschinebrau in Sonnenbuehl near Stuttgart invented a new form of vertical transportation. He applied for a patent in the same year and when it was granted he named his invention the Schmid Peoplemover. He built the first prototype at his engineering factory and then worked with Thyssen Aufzugswerke (now part of ThyssenKrupp) to scale production of his Peoplemover system. 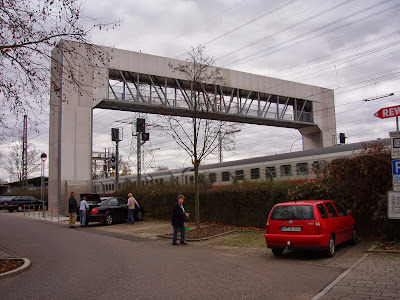 The first Peoplemover was installed in Pfulligen, Germany in December 2001. What is the Schmid Peoplemover? The Schmid Peoplemover enables pedestrians to cross major roads and thoroughfares or railways without the need for traffic lights or railway crossings. This is achieved by taking passengers up and over the traffic. The Peoplemover is built as a free hanging system and consists of two towers, a bridge connecting them and a lift car. The Peoplemover is ideal for pedestrians in wheelchairs or with strollers or suitcases. It is of benefit to all pedestrians and cuts overall journey times because there is no need to wait for traffic lights or railway crossings. has a rated load of 600kg and a speed of 1mps vertically and 2mps horizontally. There is a limit of 5 metres for travel height and a span of 20 metres. A total of 720 passengers per hour can make the crossing in both directions. How Many Schmid Peoplemovers are in Existence? Peoplemovers can be installed in a wide variety of scenarios: the crossing of streets, railways and waterways etc, linking motorway service stations to car parks and at shopping centres, exhibition centres, leisure parks, hotel complexes, and hospitals. There are currently 3 lifts of this type in Germany at Pfullingen, Altenbach and in Berlin. You can watch a video of the one at Altbach Peoplemover here. Peoplemovers are a very special type of vertical transportation. Dunbar and Boardman is the lift, escalator and access equipment consultancy. Are you currently planning a project that will involve vertical transportation? We would be happy to discuss with you. Give us a call on T +44 (0)20 7739 5093 or send us an email via peterboardman@dunbarboardman.com to start the conversation.